What exactly is Ergonomics? And how can it help you or your company? See how Human Hoist Can Help! Ergonomics can be defined simply as the study of work. More specifically, ergonomics is the science of designing the job to fit the worker, rather than physically forcing the worker’s body to fit the job. Adapting tasks, work stations, tools, and equipment to fit the worker can help reduce physical stress on a worker’s body and eliminate many potentially serious, disabling work-related musculoskeletal disorders (MSDs). If work tasks and equipment do not include ergonomic principles in their design, workers may have exposure to undue physical stress, strain, and overexertion, including vibration, awkward postures, forceful exertions, repetitive motion, and heavy lifting. Recognizing ergonomic risk factors in the workplace is an essential first step in correcting hazards and improving worker protection. Ergonomists, industrial engineers, occupational safety and health professionals, and other trained individuals believe that reducing physical stress in the workplace could eliminate up to half of the serious injuries each year. Employers can learn to anticipate what might go wrong and alter tools and the work environment to make tasks safer for their workers. 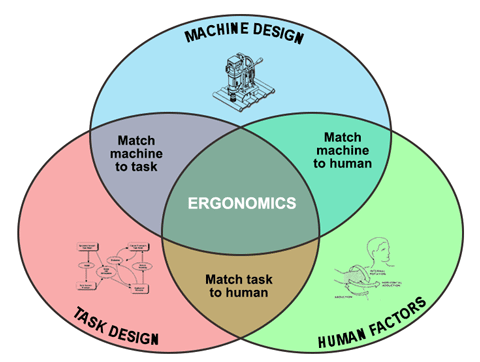 Click Here to check out "The Ultimate Guide to Workplace Ergonomics" by Ergonomics Plus! These risk factors, either alone or in combination, can subject workers’ shoulders, arms, hands, wrists, backs, and legs to thousands of repetitive twisting, forceful, or flexing motions during a typical workday. Call Human Hoist today to see how our innovative, ergonomically designed, one-of-a-kind product can help bring an end to work-related injuries!